The daily farm chores are at a quite manageable level these days. It allows us to work, think, plan and meet up with friends and colleagues. Planning for conferences, giving talks about farming, writing grant proposals, building models, conversations about ideas. How to expand farming. How to harness the sun. How to put food by. Homer loves to grow things, but hates the tedium and monotony of setting seeds. Without a tractor (and no desire to own one) the setting and starting of seeds is a time consuming and thankless task. The dirt is the same color as the seed. The most favorite vegetable, the carrot, sprouts from tiny tiny seeds. After several years of planting by hand and finding gaps and crowding and many weeds...and carpal tunnel from thinning and a disappointingly small harvest Homer has worked to find another way. 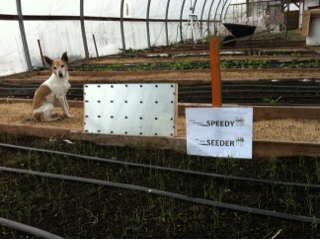 The result is his Speedy Seeder. This planting method blocks weeds, allows known precise location of seeds and spacing, and enhances germination of seeds for an exact number of harvestable vegetables. In short, for a farm like ours, this little piece is a game changer. Each week we deliver 8 shares of vegetables to 40 households. Using the Speedy Seeder, we can get seeds in the ground weekly, with the knowledge of exactly how many we have in the ground. 40 shares of 10 carrots each, each week? That's 400 carrots a week. On 3 inch centers, Homer now knows exactly how many to put down (with a few extra for the farmers) and can do this with every tiny seed we plant. We submitted this for a kickstarter campaign, and have been approved for it. This will enable anyone to order a speedy seeder and get delivery in April of 2013 if we make it to full funding. Launch will be in January, and the campaign will run for 40 days. Funds raised will go to paying for tooling, packaging, legal production and shipping fees. Meanwhile, work continues on the house of the future. A site has been located, renderings rendered. A scale model will be constructed this week. We are also working with York BFBL to have a yearlong slate of events next year. Planning, budgeting and scheduling are under way. And bigger visions too: how to support farmers keeping animals on grass, locating and building large enough infrastructure of support for products produced, lining up funding. And little by little our farm and infrastructure is shaping up too. Not exactly where we want it yet, but more visible everyday.